Unwrapping Cape Town with you. to find something you don't want to miss. Every week something you don't want to miss. Subscribe now! Everyone is wondering: What is the Dark Horse in Kloof Street? 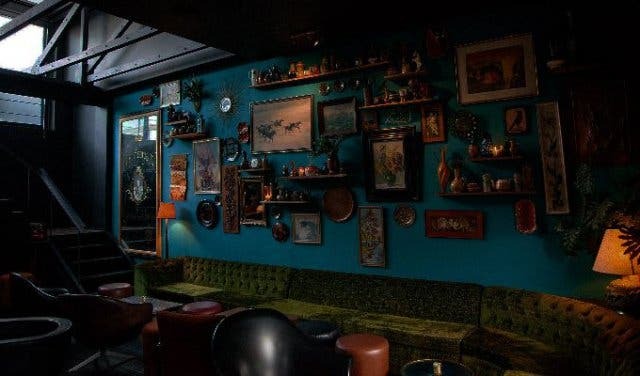 There’s a mysterious new spot in Kloof Street – it’s a bit of a dark horse really, with its cool mirror on the ceiling, comfy couches and plenty of interesting things hanging on the walls. The Dark Horse bar, located opposite The Black Sheep restaurant, has been open for the past month or so and we’ll tell you more as soon as we know. While you’re waiting for Dark Horse, check out Black Sheep restaurant in Kloof Street. Amazing food and incredible atmosphere at Kloof Street House. Get your veggie and junk food fix at Lekker Vegan Kloof Street. Great burgers and doing good at the same time at RobinHood in Kloof Street. Authentic Mexican tequila, thin-crust pizza, live music, and beer on tap at Striped Horse Bar in Kloof Street. #CapeTownMagNew discovers exciting new places in and around Cape Town and the Western Cape. CapeTownMagazine.com celebrates entrepreneurship by telling the unique story of your business. Follow #CapeTownMagNew on Twitter and Facebook to stay up to date on new places and experiences or read more here about new places in Cape Town. Use our events section for an up-to-date overview of what’s happening in the city, ‘burbs and dorpies. Join our newsletter and get quick access on the go by adding us to your mobile home screen for the ultimate guide to discoveries in Cape Town. Follow and like us on Twitter ❤ Facebook ❤ LinkedIn ❤ Instagram ❤ Pinterest for updates. Catch the annual Easter Football Feast when it takes over Belhar's Erica Park. © 2005 - 2019 Cape Town Magazine PTY Ltd. All rights strictly reserved [2005 - 2019]. Curious to make exciting discoveries in Cape Town every day? "LIKE" us for a daily hidden gem.